This item is MADE TO ORDER. Quantity shown does not indicate stock on hand. Please note current production time during checkout. This Communion Plate and Chalice set would be perfect for your church or wedding ceremony. 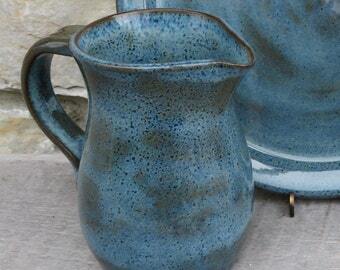 Glazed in your choice of colors over dark clay, this pottery set has a very rustic, homey feel. The Communion plate measures approx 8 or 11 inches, and the pottery chalice stands about 6-7 inches. The pitcher holds approx 24 oz. This communion plate and chalice set is made to order just for you! Please allow time for production. 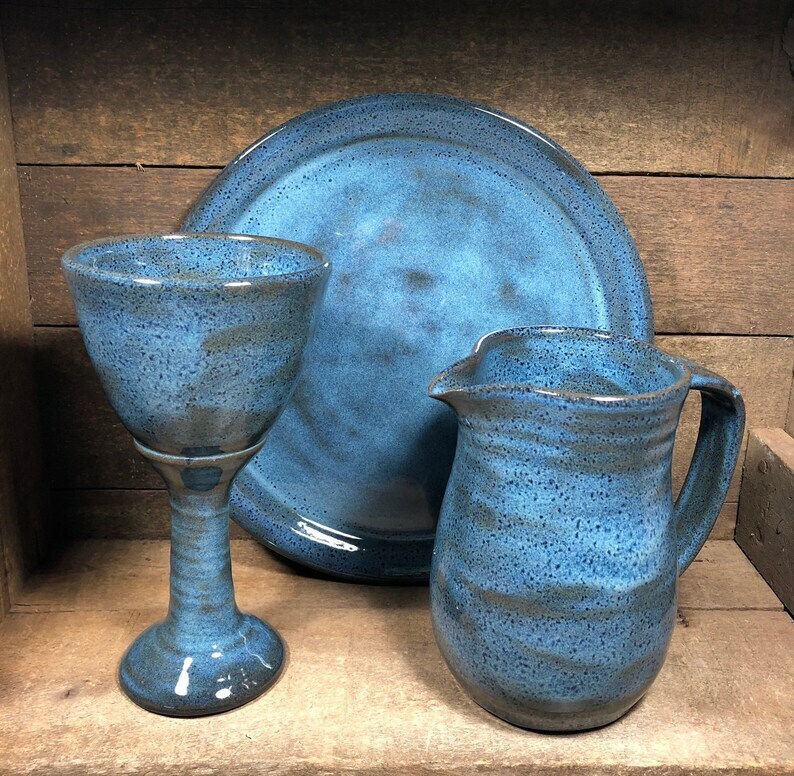 Pottery plate and chalice pieces are microwave and dishwasher safe. This is a stock photo. Your communion pottery pieces will be equally unique and beautiful. It is a beautiful set. Very nicely finished on the bottoms too. It was so carefully wrapped and shipped. Can’t wait to use it at church. Thank you. I had been looking for a set like this for a long time. It is just what I wanted, and exquisitely crafted. I love it! beautiful set, delivered promptly and when I requested a different address, it came to where it was requested. I heartily recommend this artist!